What might these people have in common: a humorous economist who played Ferris Bueller’s teacher; an Oscar-winning actress and activist; a Hall of Fame quarterback and live-wire football analyst; and a former CSI star and best-selling author? If you’ve been paying attention for the past several seasons, you might easily guess their common denominator is the Broward College Speaker Series, which enters its sixth year in January at the Broward Center for the Performing Arts. 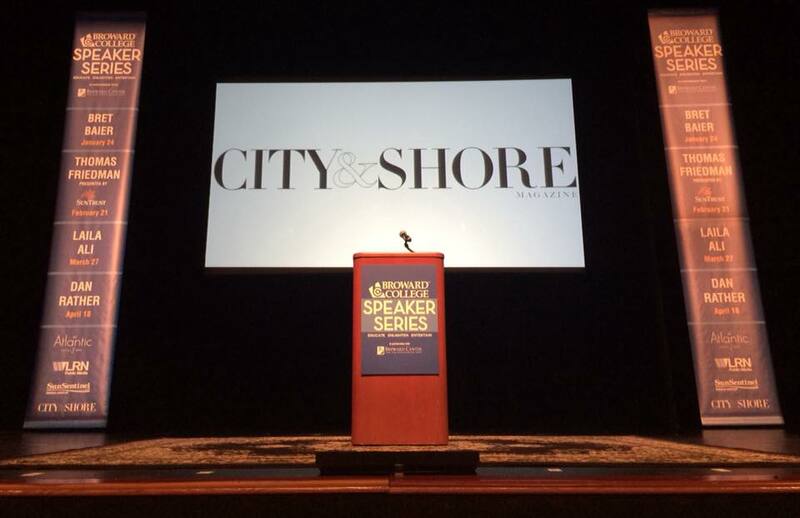 Since its inception, the series, sponsored by City & Shore magazine, has presented lineups defined by diversity as much as by its three-Es of community engagement: Educate, Enlighten, Entertain. “We keep that in mind when selecting the speakers each year,” says Gregory Haile, who became the college’s seventh president in July. “Our community is diverse and we are always looking for ways to show how we value and celebrate this diversity. With the Speaker Series, each year we try to offer presentations that reach across interests and different groups while still having general appeal. A career public servant, community leader and educator, Haile is well-acquainted with the college’s connections beyond the campus. For the previous seven years, he served as its general counsel and vice president for public policy and government affairs. The key word being “different,” the series starts the new year in offbeat style with Ben Stein, who on Jan. 16 will rhapsodize on “Politics in America!” A gifted economist, curmudgeonly humorist and longtime columnist for The Wall Street Journal, Barron’s and The New York Times, Stein is one of those one-of-a-kind personas. His career’s almost absurd range is epitomized by two well-known but widely disparate endeavors: a speechwriter for President Richard Nixon and the economics teacher in Ferris Bueller’s Day Off. Also known as an expert on bringing meaning to life and work, he is author of Yes, You Can Supercharge Your Portfolio! ; Yes, You Can get a Financial Life; and How to Ruin the United States of America. Another extraordinarily distinctive persona — albeit a totally different variety — arrives Feb. 6, when Marlee Matlin speaks on “Nobody’s Perfect: Achieving Inclusion, Diversity and Access.” The actress, who lost her hearing at 18 months old, received worldwide acclaim and an Academy Award for her debut in 1986’s Children of a Lesser God — becoming at 21 the youngest recipient of the Best Actress Oscar and only one of four actresses to win for their first role. Never dictated or deterred by her deafness, Matlin has dedicated herself to causes from diversity and LGBT rights to domestic abuse and addiction. A staunch advocate for children, Matlin has helped to raise awareness for better hearing health for millions of deaf and hard-of-hearing children and adults in developing countries. In 2015, she developed “Marlee Signs,” the first celebrity-driven American Sign Language teaching app, and she has signed the National Anthem at three Super Bowls. The program takes a bit of a turn toward left field the following month with the — let’s just say “colorful” — Terry Bradshaw. The NFL legend’s larger-than-life personality plays just as well on TV as an Emmy-winning Fox football analyst as it did on the field as winner of four Super Bowls in six years with the Pittsburgh Steelers. But his career has also transcended football as a best-selling author, a TV and film actor and, yep, a gospel singer with three hit albums. On March 11, Bradshaw will command the microphone to ask the question, “Why Not Your Best?” Having overcome humble beginnings and the depths of depression, Bradshaw will tackle the issues of sacrifice, pain, competition and adversity, explaining how the power of positive thinking helped him to attain success he never dreamed possible. A similar theme echoes from a dissimilar perspective on April 24 as actor, author and philanthropist Hill Harper comes “Sailing the Seven C’s of Success.” Harper is perhaps most recognized for his starring role in the blockbuster CBS drama CSI: NY, on which he portrayed Dr. Sheldon Hawkes from 2004 to 2013 and for which he won three NAACP Image Awards for Best Lead Actor in a Drama Series. Now Harper stars on ABC’s hit drama The Good Doctor and hosts HLN’s How It Really Happened With Hill Harper. His credits also include CBS’ Covert Affairs and Limitless, and Showtime’s Homeland. The author of four New York Times best-sellers, Harper has earned seven NAACP Image Awards for his writing and acting. He founded The Manifest Your Destiny Foundation, dedicated to empowering underserved youth through mentorship, scholarship and grant programs.